Then DisneyBound is perfect for you. If you've never heard of DisneyBound then let me quickly explain a bit about it, DisneyBound was created by the fabulous Leslie Kay! Its a place where she takes all things Disney and creates ideas for outfits that embodies those characters. She creates outfit ideas for all sorts: princesses, prince's, villains, sidekicks, even theme park attractions, anything Disney you can bet she's created an outfit for it! Leslie, a self confessed 'peter pan child' shows that Disney isn't just for children, by showing an inventive & pretty damn cool way for us all to get in touch with our inner Disney geek! Such a great idea right? I've followed her blog for a while now & its so amazing to see how much the concept has flourished and how many people are taking notice of it, and I'm really pleased for her! You get the idea now? Isn't it just such an amazing concept! I really wanted to share it with you, in case you hadn't heard about it & your a Disney geek like me who this would appeal to! 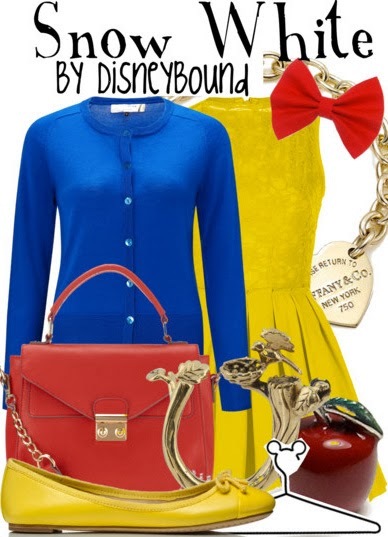 If this kind of thing interests you please follow DisneyBound & Leslie on all the social media! And here is my attempt at my own DisneyBound! (Last New Years Eve -- woah time flies) If you don't know who I am then shame on you! hopefully plenty more to come in the future. Are you a Disney geek like me? What do you think of the DisneyBound idea? Would you add a bit of Disney to your wardrobe? I've seen a few of these, I don't think I'm quite brave enough to wear an obviously Disney inspired outfit on an everyday basis but I love the idea of it and the subtle ones are my favourite!